We have only 4 dive sites close to the island of Pianosa. There are buoys dedicated exclusively to authorised diving boats. Other 2 buoys could be opened during the 2017 season and that are located close to an underwater archaeological site of extreme value. 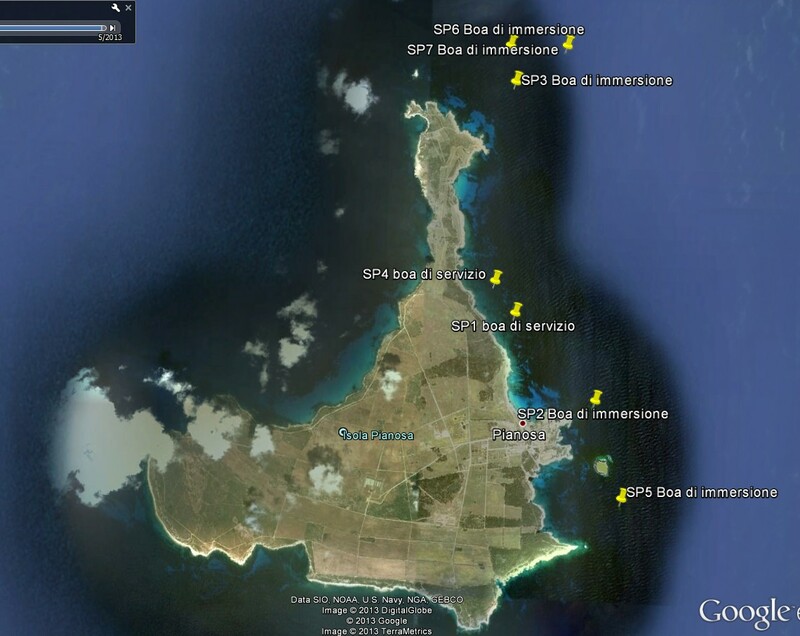 All dives are located on the East side of the island or the closest town, you can see very well on the map below. In all cases are rocky pinnacle formations coming from the bottom to the surface. After 2 hours we change the buoy choosing among those booked earlier. The reservation must be made one day in advance (subject to availability of buoys) via an online portal connected to the PNAT site. Only registered and authorised by diving PNAT receive access to the portal and still can not make more than two successive bookings to ensure a fair shift working on buoys. All reservations are prepaid and non-refundable tax required by PNAT for daily access to the buoys. We can access only four days a week always excluded Tuesday, because on that day there is a ferry from Piombino and for safety reasons it was decided to leave closed. Other days may change depending on the season. I like scuba diving and my favorite scuba spot is Togian Island Indonesia. I have decided. my next scuba trip will in Pianosa.